The House Of Extraordinary People is a three part documentary on Channel 5. The show follows 9 people with unusual appearances which challenge the views on what “beauty ” is and it really means in today’s society. They live together for 10 days confronting public prejudices and facing their own biggest fears but giving each other support throughout the whole time. From getting jobs at restaurants interacting with members of the public to going for a spa day and letting spa staff do beauty treatments on them. As well as doing a bit of speed dating. Watching this documentary really helped me to feel more self confident in myself and I wish shows like this were more around when I was at secondary school. By watching this documentary it made me feel that I am not alone and that I’m not such an outsider. Throughout my school years I was very badly bullied because of my disability and the way I looked compared to other girls in my year. Other students made me feel like a freak. Going through all of this everyday at school and sometimes on social media made me want to end my life. At school I felt that I had a lot of peer pressure from the way I dressed to how I had my hair or the shoes I wore to even who I was and wasn’t allowed to speak too. Otherwise I would be dropped out of what I thought at the time was my friendship group. I think even now the level of peer pressure for young people has grown massively and it will continue to do so and the pressure will get worse. This documentary really helped me to celebrate rather than hate the things that make me unique. I think that documentary’s like this one should be shown to students in their lessons as I feel it could really help to build up confidence and self love. I also think this would help children and young adults to realise that we all come in all different shapes and sizes and we all can look different and that shouldn’t be frowned upon. I think children should be taught about how everyone is different and beautiful in their own way at primary school as I feel this effects more younger children than we think. I also think that if children go through bad experiences because of how they or others feel about them or see them can have a huge negative impact on the child’s life many more years down the line. Throughout my life I have had low body confidence, low self esteem, low self worth to name a few. Their were times I wished I looked more “normal” that I fitted in or that I looked like the girls in magazines to celebrities I thought were really pretty. I just hated the way I looked I found it hard to look in the mirror everything I saw on myself I hated and I wished I could change it. I feel if documentaries like this one was shown to me by school I would have understood more and believed that their is no definition on what “beautiful ” is because we all have different ways we see beauty in ourselves and others. Lastly this show has helped me to really embrace myself for who I am on the inside it’s not only about the way we look on the outside. I believe more documentaries like this one should be made as I think it would help people of all ages with their own mental health. When I am at college I sometimes find expressing my emotions to others very challenging. As I can feel threatened in this environment due to my past experiences at school with being bullied. The bullying affected me so much doctors diagnosed me with PTSD. To help me process and communicate with others I sometimes use communication aids to help me express myself in ways I feel safe and comfortable to do so. To help me communicate with others I have done Lego Therapy with my support staff but also in small groups with other students. Lego Therapy is all about trying to identify your emotions by putting a colour to it. For example my happy colour is yellow and my safe colour is green. I use Lego because sometimes I might be feeling more than one emotion so we stack the Lego bricks onto each other. Lego helps me because in the past whilst doing this with other students I have had to do our whole week in colour. By seeing my week visually using Lego has helped me to understand that my emotions can be mixed and that is ok. Doing this has helped me to identify why I might be feeling upset and other emotions during the week. Talking it through with colours makes me feel more relaxed in sharing how I maybe feeling to others. By dong group sessions it has helped me to understand that I am not “silly” for feeling some emotions as others can feel similar emotions to me in some situations. By using colour I have been able to cope better with my feelings and thoughts rushing around in my head at 100 miles an hour. Sometimes when this happens I don’t know what’s going on.However if I can find a colour that best describes how I am feeling this can help to slow down my thought process into a more manageable way and it becomes less scary and less overwhelming for me. I use this to also help me to tell others how the voices I live with are making me feel. I have coloured circles attached to my bag which I take with me all the time. Each circle is a different colour with the emotion it makes me feel on it too. So if I am out and about and feel I can’t tell someone how I am I can show them the coloured circle I am feeling. By having the circles with me makes it more discreet when out and about as I don’t need to get Lego out. I find using this resource also really useful after I have had a seizure as I can find it very hard to communicate with others because I find it hard to speak or I am hard for others to understand. I am now able to use this if I need to when I’m out and about with support workers, my family and friends. Using Lego has helped me a lot in understanding emotions and that it is ok to have mixed emotions! If you’ve visited my blog or social media pages before you may have noticed a change; yes that’s right I now have a new logo! My logo was designed and created by one of my best friends Alice Draine who is also a very talented graphic designer. Thank You so much Alice for creating this for me! I wanted my logo to be personal to me; my favourite colour is purple however I also wanted my logo to be different from what the disability symbol is known and recognised as which is the colour blue. I like the way the international recognised disabled sign is covered by a figure that looks “normal”. For me this shows and helps to represent that not all disabilities, illnesses and conditions are visible. I feel that this also helps to remind people not to judge a book by its cover. 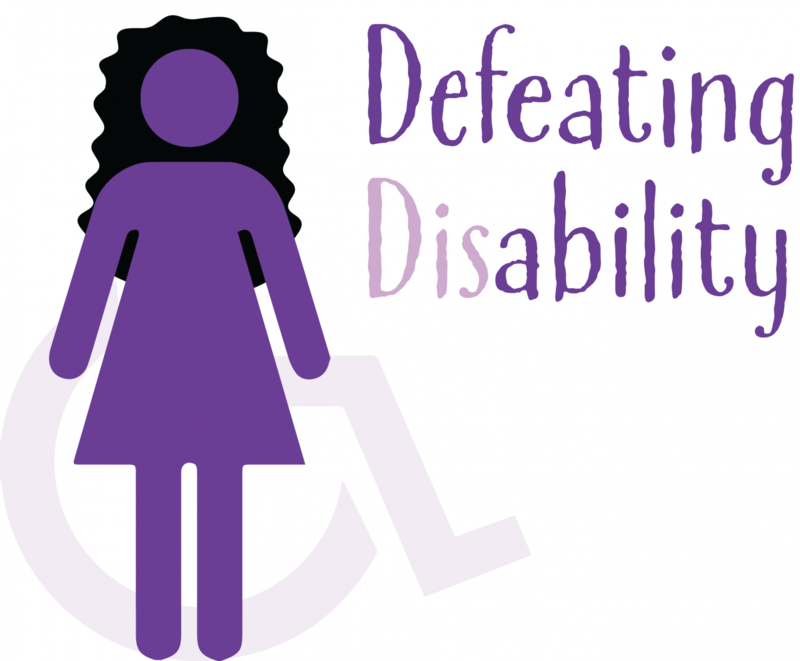 I love the way the disabled symbol shows through the figure and the symbol looks lighter and darker in different lights, it has a sort of translucent effect to it. As well as this I love the way the figure has dark curly hair like me as I am also known by my curly hair. I feel that the figure helps to bring out more about me and my personality. I love the type face as it is fun but still easy to read. I like the way the disability symbol sort of points to the lighter coloured words. I think this really helps get my message across that not all disabilities or conditions are the same. Using the disabled symbol in the design also helps to show what my blog is all about as I write about disability and mental health and my life living with my conditions as well as other topics too. Just because someone is smiling that doesn’t mean they are happy or ok. A smile has the power to hide the most saddest and darkest most painful feels , thoughts and emotions to the outside world; to others nothing seems wrong but inside you are a mix of emotions all going at 100 miles an hour. A smile can be like a shield you use to protect yourself from the outside world and everyday situations. In the past I used to smile and try and look happy to the outside world but actually I was in such a dark and scary place that I didn’t know how to get out of. At school I was getting bullied constantly every time someone said something horrible and upsetting to me I would try and not show them how much hurt they were giving me. I didn’t want to look hurt because I knew that they would carry on, laugh and it would probably get worse. I felt suicidal and just wanted it to stop I saw no light at the end of the tunnel. I remember trying to tell adults I trusted what was going on however I was terrified because I knew if the bullies found out something even worse was going to happen so I just smiled and tried to look cheerful. I did tell some teachers what was going on but they didn’t believe me or they would tell me everyone gets bullied and that I should feel sorry for the people bullying me, other teachers tried to help but couldn’t. For me I found out that a smile could be so powerful because by smiling it used to trick me into thinking everything was fine and that it was completely normal to be getting bullied by lots of people on a daily basis. I suppose what I’m trying to say is just because someone looks happy to you doesn’t mean they are. We are all fighting things others can’t see or don’t know about. For me a smile was my way of trying to cope with things the best way I could. Today is self-love day; for me self-love is a very difficult emotional journey as I have low self-esteem and low confidence due to past experiences. I often think people around me are talking negatively about me, I might be in a queue waiting to pay for something or I might just be walking to my class at college. I sometimes feel that I am too short or that I should be thinner. Self-love is so hard for me a because I can be positive about others but when I look at myself in the mirror I just see and think negatively for example the voices in my head say “Bryony you’re not tall enough” or “Bryony your outfit would look so much better if you were a small size. At school I was bullied by some kids because I have curly hair so for a long while I hated having curly hair and the voices in my head would be like ” Bryony why do you have such frizzy hair it’s not all long and smooth it’s just a heap of frizz”. Even though I have a long way to still go with my own self-love journey I thought I would share with you some of the things I try to show myself self-love and be more body positive. I love to just watch a TV program I like or go on YouTube and watch my favourite YouTubers. 2. I enjoy taking my dog for a walk and bringing my camera along too so I can practice my photography. 3. I enjoy trying out new makeup looks or trying out my new makeup products. 5. If I have had a long day I enjoy having a lovely bubble bath sometimes adding in a Lush bath bomb. 6. I enjoy sometimes just doing some home baking and baking. 7. I really enjoy just sitting down and read a book or doing word searches. With my past care coordinator we recently came up with the idea that I should try each day to say something positive about myself too myself. For example” Bryony I like the way you have done your hair today or” that colour top really suits you”. We also spoke about writing these statements down so when I am in a low place I can look at them. WARNING: You may find this triggering or upsetting to read! On the 7th February 2019;Time to Change had TimetoTalk Day. This was a movement all about raising awareness of the importance of talking to others about mental health. So it got me thinking and inspired me to write this blog post; in this post I will be writing about how opening up about the difficulties I was facing lead to me getting help. I still remember the day I first told my mum about what was going on and how I was feeling. I was having dinner at the kitchen table like normal and then I just started crying went into the living room and that’s when it all came out. It was finally out in the open everything from how low I was feeling and that all I could see was darkness and I felt trapped I just wanted to end it all. I opened up about the visions I was seeing and the voices I was hearing and my nightmares. I was so scared to tell anyone as I thought they would find me a complete freak. At the time this all started happening I was also getting bullied by lots of different people at school and it had been going on for years. I didn’t want to tell anyone as I knew if the bullies found out they would bully me even more. To be honest it was a sigh of relief when I finally was able to tell someone about everything. I felt like a huge weight had been lifted off my shoulders. Through opening up about what was going on I slowly began to realise the darkness I was facing I didn’t have to go through it alone or keep it a secret from everyone and pretend everything was ok when it wasn’t. I also realised that the people who truly care and love me didn’t see me as a freak they wanted to support me in getting help. Even though it was terrifying for me to tell my mum as I didn’t want to upset her as well as this I found it scary to get it out in the open. I’m glad I did because even though I still suffer with my mental health on a daily basis with depression, PTSD, my voices and more I feel like more people can help support me daily. I have worked on lots of different things with lots of different types of professionals making myself what I like to call my “tool box “as I have learnt lots of different types of strategies for coping for different things and communicating with my voices. In the past I have made a Self-Care Box or little reminder cards I can use or have positive statements on a piece of small card so I can look at it if I have low self-esteem or low confidence to name a couple. I now feel less alone! I have been a Performing Arts Student at my local Stagecoach School for the past 3 years. I have found that Performing Arts has a really positive impact on my mental health. As you may know I have mental health problems; sometimes this can be very hard to tell or explain to someone anything about my difficulties. However Performing Arts has helped me to express my feelings and emotions in many different ways both physically and verbally. Through doing workshops in dance and movement I have been able to express how I am without having to speak all the time. I also find that dance can help me to identify how I am feeling and by doing this I can start to make more sense of my emotions and I start to feel less anxious and scared. I enjoy singing lessons as I find that sometimes when learning a song the words really “speak” to me and I feel more connected with the song. This not only helps me to perform it better and with more emotion but I start to feel less alone. Sometimes when I singing a song I try to focus on the song’s lyrics and try to relate the song back to an experience I have had. This can help my PTSD as I do sometimes use this as a way of helping me trying to process a traumatic event from my past. I have tried this in past sessions with my psychologist. In my acting classes I enjoy being” other people” but I have found if possible trying to use my experiences in acting has really helped me to process negative experiences. I find when I use my experiences in acting it helps me to tell the story more and the audience starts to feel more involved with the show. I find doing Performing Arts a creative, good and safe way to express myself and to challenge my past experiences such as being bullied in a positive way! Performing Arts is helping me with my on going journey to growing in confidence and not have such low levels of self-esteem. Performing Arts has such a positive impact on my mental health , in the future I would love to do acting professionally! Please be aware this is just about my experience and that I am not a medical professional! Back in 2015 I was diagnosed with PTSD; I remember being asked what I knew about the condition and to be honest I knew soldiers could be diagnosed with PTSD and that you have flashbacks to past events but that was about it. I never thought I could be diagnosed with it because of the horrible things I went through with being bullied at school. Through the years of living with PTSD I have learnt quite a lot about my condition on a daily basis and also hearing the myths about PTSD. I thought I would share with you things I learnt about it through living with the condition in everyday life. 1. Anyone can be diagnosed with PTSD not just soldiers. 2. Triggers can happen even through the smallest of things. For example I sometimes get triggers if I see a young person messing about with their mates. For me this can take me back to my experiences of getting bullied quickly. Sometimes the flashbacks just come and I don’t know why. 3. PTSD does not have to come immediately after you have gone through something traumatic. I was diagnosed with PTSD from being bullied when I was in school but now I am not getting bullied by others but it still affects me to this day. I find it hard to trust people in college as I don’t know if they are being genuine. 4. I remember when I once told a teacher that I had PTSD and that’s why I was in a bit of a panic they said to me ” get over it and could I really blame them for picking on me. “At the time I felt so stupid and weak. But now I realise that having mental health problems doesn’t make you weak at all in fact I would say on the good days I have it has helped me to realise having mental health problems is not weak at all and it doesn’t define you ! From a young age I have loved baking especially with my mum. As a young child I found it magical to see how the cakes in the oven would change and get bigger and bigger. Or seeing how the biscuits got all golden; not forgetting the wonderful smells they created coming from the oven. My mum used to come into my primary and do cookery lessons, we learnt how to make lots of different things from cheese scones, jam tarts and marble cake to name a few. A few years ago I went into a mental health hospital for a couple of weeks. I had 1:1 sessions with the occupational therapist (OT for short). The OT and I had quite a few sessions together baking. We would bake party food together such as cupcakes,biscuits and brownies. I would make party food because when someone was due to leave the ward we would have a little leaving party for them. I enjoyed doing baking activities whilst in hospital as it helped me with my anxiety as I started to feel more comfortable around others. I found by baking it helped me to talk to others and start conversations. People would ask me questions like “what recipe book did you use?”Or “how much chocolate did you use ? “. From just these few questions the conversations I was having grew and before I knew it I had made new friends. I loved seeing others enjoying my baking! Last year at college I did baking sessions to build up my independent living skills. I would make all the recipes from scratch and my 1:1 helper would help me to make each recipe. I made things such as Victoria Sponge Cake, Black Forest Gateau Cake and Pineapple Upside Down Cake. At college before I made anything I would go on the computer and look at a supermarket website to see how much the ingredients cost and how much I would be spending to make each recipe. I would then go to that supermarket and buy the ingredients I needed. Baking helps me to improve my maths as I have to weigh each ingredient correctly to make sure the recipe turns out right . I also need to make sure the oven is on the correct heat and I have to manage my time efficiently because my baking needs to be done and cooked properly before the end of the day. Sometimes when baking I will need to rub butter into the flour with my finger tips to make a crumble type mixture, by doing this with my hands I am building up my hand strength; I need to make sure I am building up my strength as I am weaker on one side of my body due to my disability. I find following recipe instructions sometimes difficult to understand so by trying out new recipes I am not only building up on my reading skills but I start to understand the sequence of the instructions. At college I enjoyed baking things for when we did cake sales . We raise money for Children in Need, Comic Relief and local charities that helped disabled people and their families.